Usually when I need a another 240volt mains powerboard, I tend to get a “pack of two powerboards for $10” at the Bunnings checkout impulse-buy zone, ’cause that’s the kind of guy I am. But, those are, to be frank, pretty crap. They usually have ports too close to each other to allow you to plug in wall-wart power supplies, so you can normally only use 2 or 3 of the 4 ports, and the quality of the sockets often means the plugs fall out or don’t feel like they really connected properly. 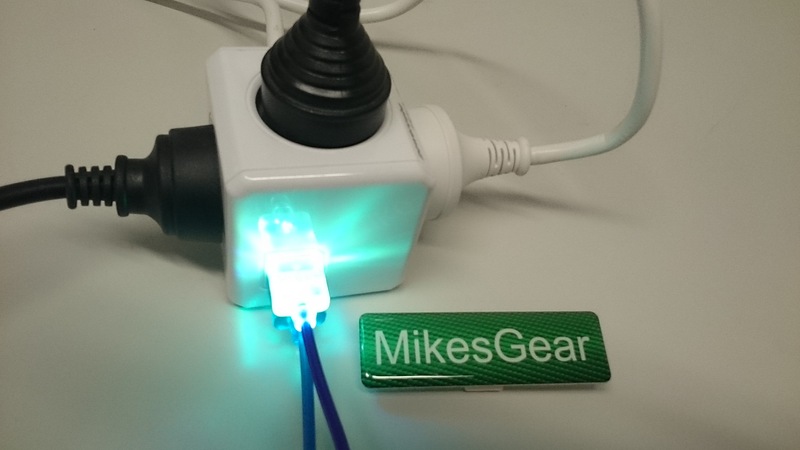 So when the Allocacoc Powercube Extended USB powerboard appeared in our warehouse the other day, I was intrigued to see that someone had figured out the problems that cheap powerboards have, and designed a better one. 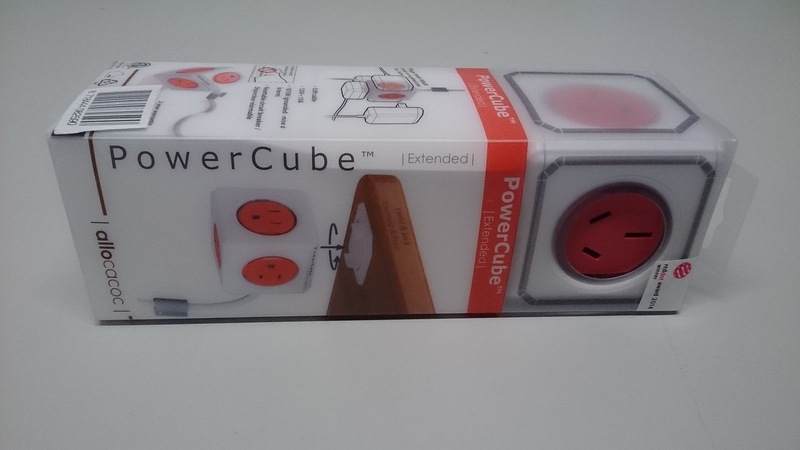 The Allocacoc Powercube Extended USB package is a slim rectangular one with a decent explanation of the functionality on the side – fits into a 500g Express Bag for shipping. They are apparently designed in Holland by some university guys, and made in China. 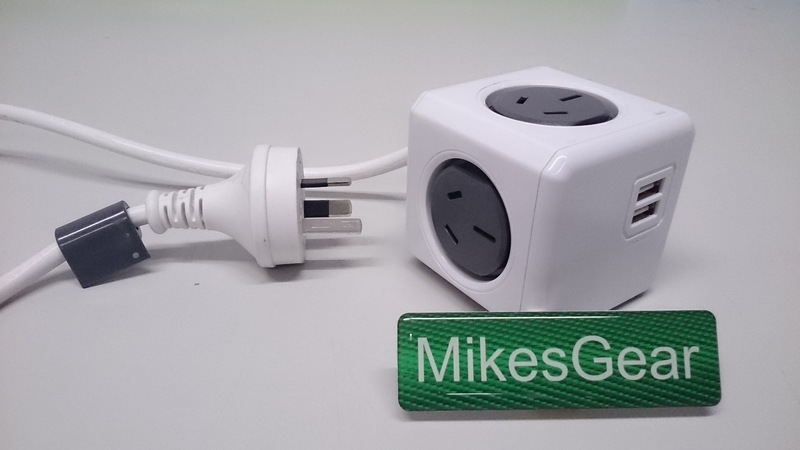 The version we have here today has been type-approved for use in Australia and complies with the standards we have here – they are available from the manufacturer’s website and flea-Bay with many other type of foreign plugs, but only the grey Allocacoc Powercube Extended USB has been approved for Oz so far – the cost of getting these approvals is surprisingly expensive, with the outcome that products made to meet the testing bodies’ high standards are not as likely to set you on fire or electrocute you as the cheapies are known to do. Inside you get the Allocacoc Extended USB cube itself, just under 7cm on a side, with a 1.5m flex cable, Australian wall-plug with insulated pins, and some accessories. The twist-clip fits onto one of the faces, and you can either screw the clip to your desk or wall, or use the included double-sided tape to stick the clip to something. There are two bits of tape – from my testing, one is sufficiently stong enough to hold a cube under my desk. 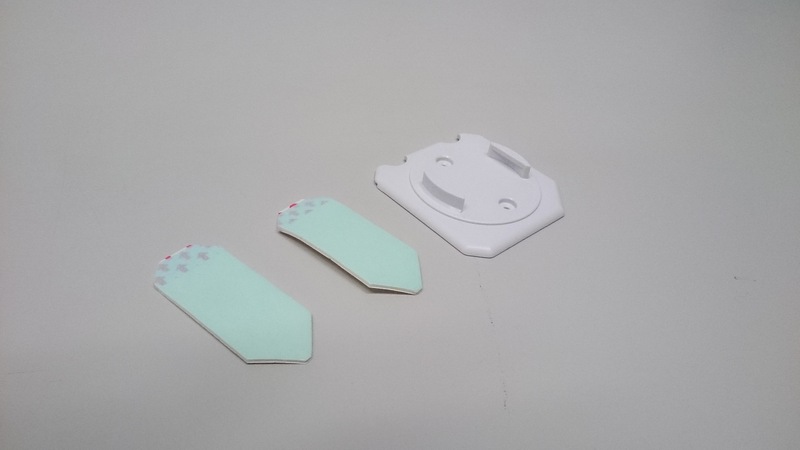 The tape has a Command-style strip left exposed at one end so you can peel it off easily enough – the clip has cutouts in one side for the tape-grip to be exposed. The flex lead has a small clip threaded onto it – this is intended to let you screw the lead to a wall or desk. Here’s one dangling underneath my desk – usually there’s lots of powerboards hiding underfoot, so this way you can avoid that issue, and there’s a handy pair of USB ports available right there at the edge of the desk for charging phones etc. 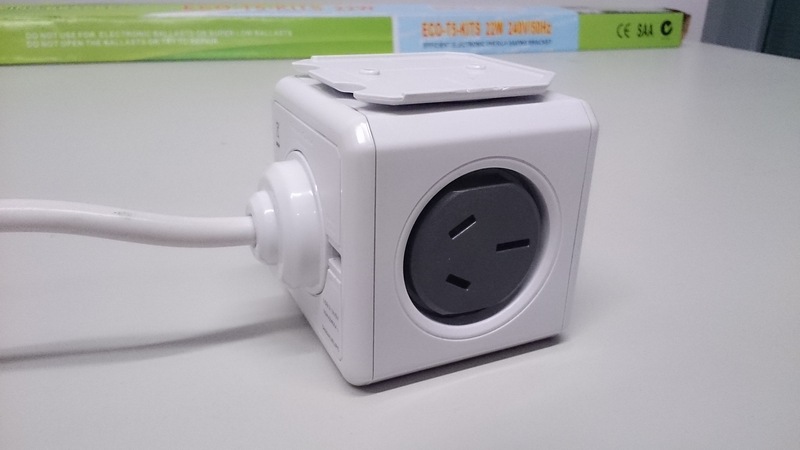 The Allocacoc Powercube Extended USB has 4 faces with Australian 240v sockets on them – you should be able to plug in the biggest wall-wart power supply to each one and not have them touch or interfere with each other. 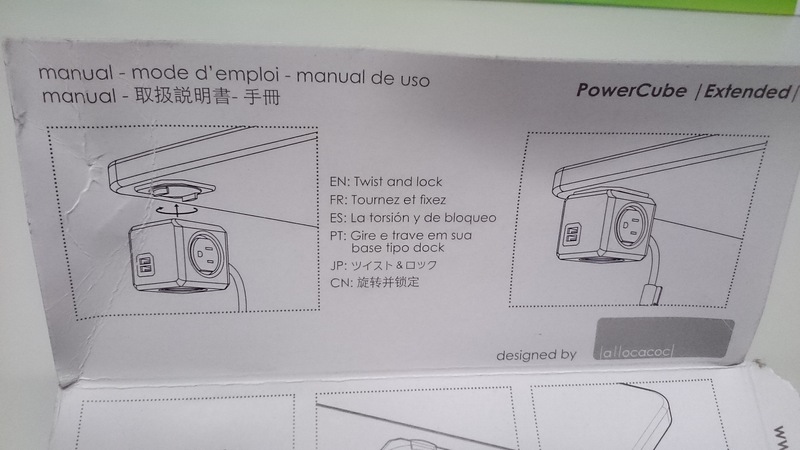 Note that using the clip will eat one of the sockets. 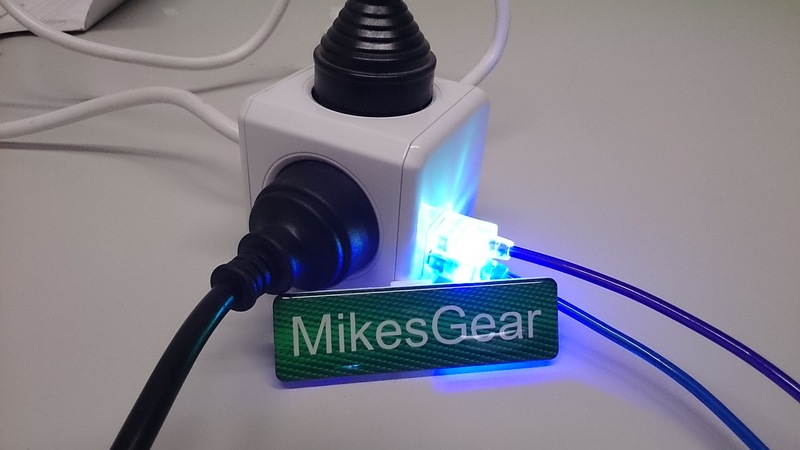 It has a 10Amp rating, which is about what the average Australian home has for it’s power circuit. There are also 2x USB Female ports for charging USB-powered devices – they are rated at 5v and up to 2.1Amps, which means they are fine to fast-charge iPads and other power-hungry gadgets via USB cable. You can plug in both USB cables at once. As an aside, these random LED-lit cables I had lying around for testing looked very cool, but they get surprisingly hot, and things that charge from them don’t seem to get as much power, so I don’t recommend buying them. 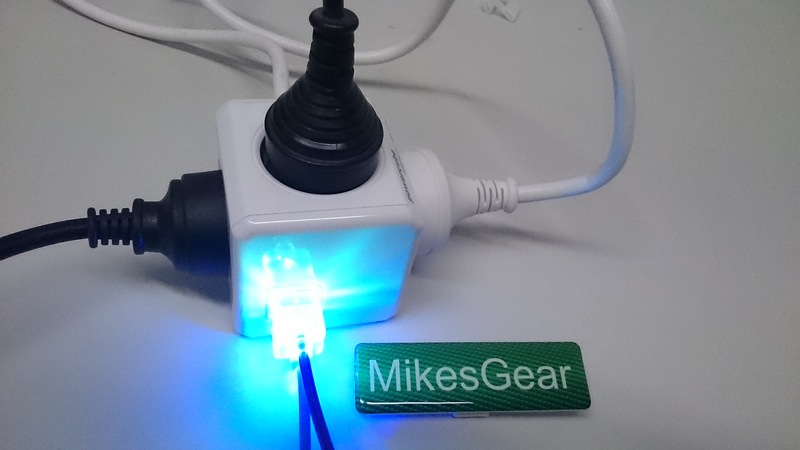 The Allocacoc Powercube Extended USB power sockets themselves are a very firm fit – I found that you needed to engage the centre earth pin into the socket before it would let you plug the angled live-neutral pins in – this may be a safety feature, I guess. You need to use some force to remove the plugs from the sockets, so there’s no chance that they will fall out on their own. 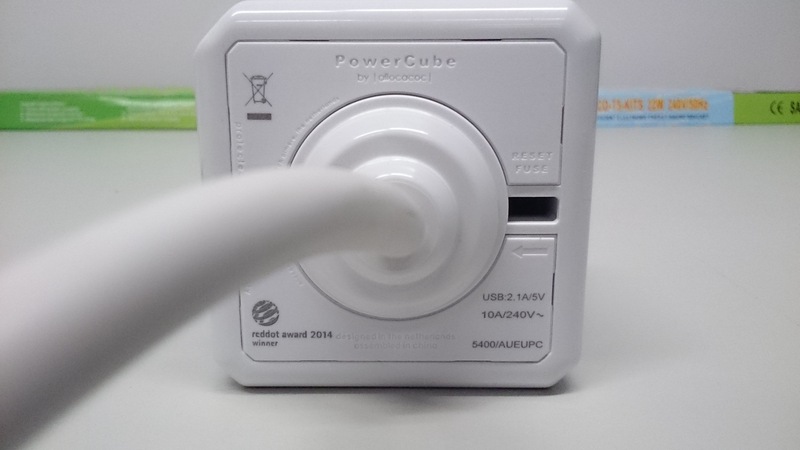 If you manage to overload it or plug in something with a leakage issue, the Powercube has safety cut-out protection and has a reset switch in the back to restore it to normal operation. These are a lttle more expensive than Bunnings cheapos, obviously. Selling for around 28 Euro or AUD $44 delivered in Australia, they are commanding a price premium for the extra capabilities. 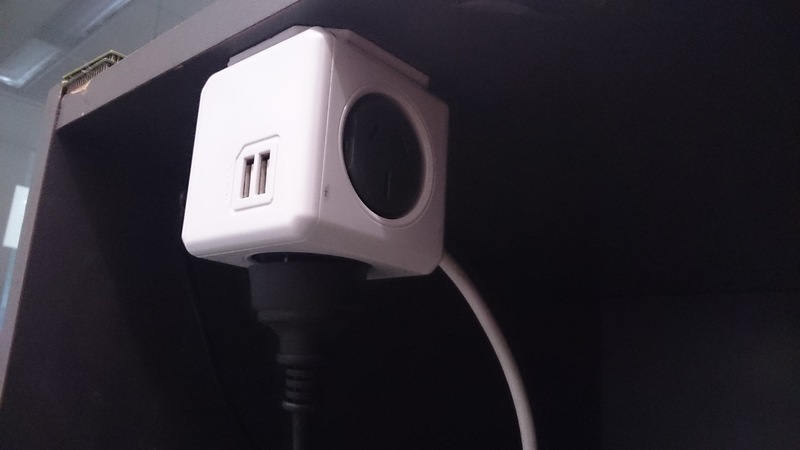 Consider that an regular-shaped powerboard with 2x USB 5V outlets and no allowance for larger wall-warts is around $50 delivered, it’d say the Allocacoc Powercube Extended USB is pretty good value. This entry was posted on September 16, 2014, 2:35 pm and is filed under Power. You can follow any responses to this entry through RSS 2.0. You can leave a response, or trackback from your own site.